(left to right) Sattviko’s Prasoon Gupta, Supa Star Foods’ Pawan Raj Kumar, Naturell India CEO Vijay Uttarwar, Yumlane’s CEO Hitesh Ahuja and VCCircle associate editor Ranjani R.
There are plenty of opportunities for food companies with specialised offerings to stand out in India’s crowded and generic market as raising capital has become easier, said panellists at News Corp VCCircle's Food & Agri Investment Summit 2018 on Thursday. 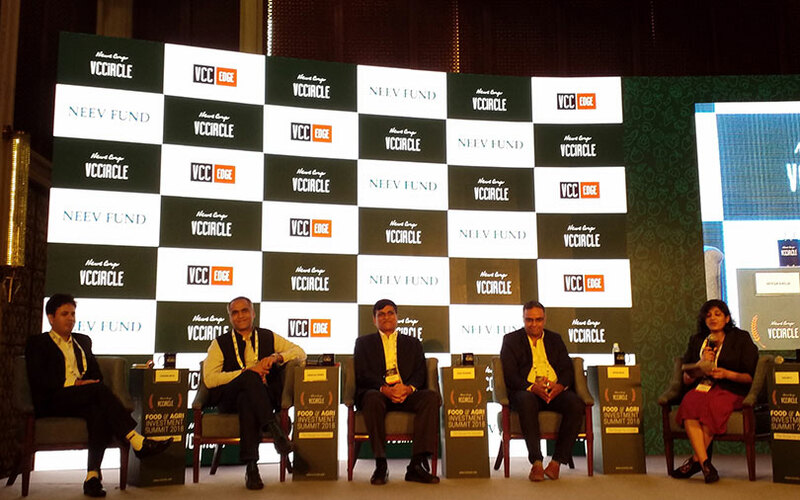 A panel themed ‘The rise of the specialist’ comprised Sattviko co-founder and director Prasoon Gupta, Supa Star Foods’ chief executive officer Pawan Raj Kumar, Naturell India CEO Vijay Uttarwar, and Yumlane’s founder and CEO Hitesh Ahuja. The session was moderated by VCCircle associate editor Ranjani R.
Naturell’s Uttarwar, whose company makes nutrition bars, said that the speciality food segment in India is still nascent but has the potential to grow tenfold in the next five years. Gupta of packaged foods firm Sattviko said that some of the large multinational companies and Indian FMCG conglomerates face difficulties in launching or improvising their existing line of products and have lower success rates as compared to startups or specialised food companies. “MNCs require a lot of financial resources, besides time and marketing initiatives when launching new products,” Gupta said. The panellists also highlighted that a specialised product should not be confused with a premium product. Instead, a specialised product should be looked from the perspective of creating different value proposition for customers and can even help ward off competition from larger and existing players. Kumar, who also runs a packaged foods firm in Supa Star Foods, said that pricing is key but works differently for different products. “Lower price points sometimes offer our customers a chance to try our products. For instance, the snack product offerings are not pricey. But that may not be the case with our mithai (Indian sweets) offerings,” Kumar said. The panellists also discussed the fundraising prospects of the sector and said that the visions of investors and entrepreneurs need to match.